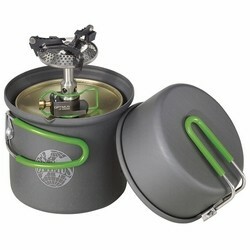 This small ultra light 3-Piece cook system is ideal for outdoor or home emergency use. The system includes the Crux Lite Stove with Optimus gas burner, hard anodized aluminum saucepan with pouring lip and a fry pan that doubles as the kit lid. All items come in a mesh storage and travel bag. System uses Butane/propane gas cannister ( not included). See item #4197. Provides hotter flame for quicker heat up and cooking. Size 10.7" X 13.6" 10200 BTU output.